We often get inquiries from new Associates about the creation of Affiliate Links (sometimes also called Associate Links). In this article, we’ll show you a number of ways to quickly and easily create Affiliate Links – and how you can earn advertising fees by placing these Affiliate Links on your website. Within Associates Central, under the Product Linking tab, you can create a link to a specific page from Amazon. This link can be inserted in the text editor of your website. 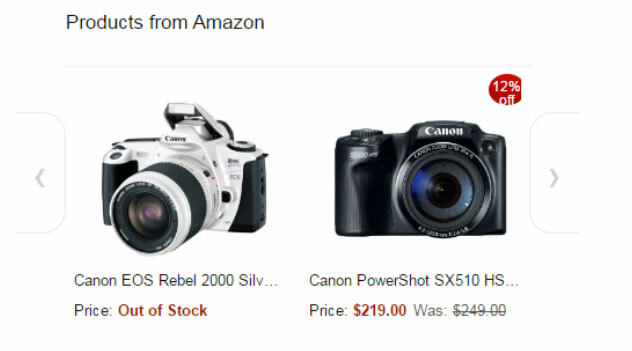 To create a Product Link, you enter either a search term, or the Amazon Standard Identification Number (ASIN) of the product into the search field. Click on ‘Go‘, and you will see a result; then click on ‘Get link’ for more options. Now, you can individualise the link in the next step. Under the option ‘Text and Image’, the link shows a small product box with a product picture and a call-to-action button in your front end. You also have the possibility to choose a text link, by clicking on ‘Text only’, or ‘Only image’ for a linked image. Easier than creating the link via Associate Central is to use our SiteStripe tool. SiteStripe – which is used often, by many Associates – is a toolbar, which is displayed to you as soon as you visit the Amazon.co.uk shop page as a participant of the Amazon Associates programme. You can then quickly and easily create HTML code, which you simply paste onto your website. You have the option to select code for text links, links with product images or links with image and text. With SiteStripe, you can create your Affiliate Links directly on the Amazon.co.uk shop page and share them on Facebook or Twitter without having to visit Associate Central. On any Amazon.co.uk shop page, you can use SiteStripe to create HTML code for a text link. Just click the ‘Text’ icon, and your Tracking ID is automatically integrated into the link. If you have multiple tracking IDs, you can make a selection using a drop-down menu. You can also use the text-link overview to determine whether you want to use the complete-partner link, or to use a short link. The options for creating a text link vary depending on whether you’re on an overview page, or a product page from Amazon.co.uk. For a text link to a product, you must already be on the corresponding product page. The created link can then be placed directly in the text editor of your website. From a product page, you can create an image link with a click on ‘Image’ and choose the right size. The last-used Tracking ID is automatically integrated, or you can choose another Tracking ID from the drop-down menu. Let’s use the example of a product page you’ve called. From here, you can create HTML code for a link box – which has the product name, the corresponding product image and the current price – by clicking on ‘Text+Image’ at any time. In addition, the Amazon logo and a ‘Buy’ button will be shown in the box. The last-used Tracking ID is inserted automatically into the link. Again, click on the drop-down menu to select another Tracking ID. In tandem with your Twitter or Facebook account, by using SiteStripe, you can directly share the previously created link. You can also enter individual text for the post. Inside Associate Central, you can create and customise various ‘widget’ links by clicking on ‘Widgets’. So, for example, you can use ‘Your Picks’ to present your favourite products on your website, or you can use the ‘Search’ Widget, which enables your visitors to search for products on Amazon.co.uk directly – place the link in the text editor of your website and you’ll have added this functionality to your website. As an Amazon Associates member, you can earn advertising fees for all qualified orders. Just click on the Widget of your choice and personalise it. Depending on which Widget you want to use, you’ll find various options for individual personalisation. Click on ‘Product Linking’ and ‘Banners’ to choose from a variety of banners of different sizes, which are sorted by categories. The HTML code can also be integrated into the text editor of your website – this code already contains your Partner ID. If you’ve created your website or your blog with the WordPress CMS, our official WordPress plug-in – ‘Amazon Associates Link Builder’ – enables you to integrate products from Amazon into your website in different ways. With the plug-in, you can search directly from the WordPress editor for Amazon products and link them from your website. The plug-in offers real-time access to current prices and the availability of the products. The integration of products works through templates, ranging from simple text or price links to product boxes with individual products… or even a product carousel with several products. It’s also possible to create your own templates, but some programming knowledge is required. Depending on the template, individual details of the product, such as images, prices and the product description, can be shown and automatically kept up to date. In addition, your visitors will be shown whether the product is currently available at a discounted price and whether Amazon Prime delivery is possible when ordering. To use the Amazon Associates Link Builder, you must first register with our Amazon Associates Products API, which is where there’s more information about the plug-in.